Safeguard your Canon M5 Digital Camera's monitor against scratches, dirt, and debris with this Expert Shield Glass Screen Protector. 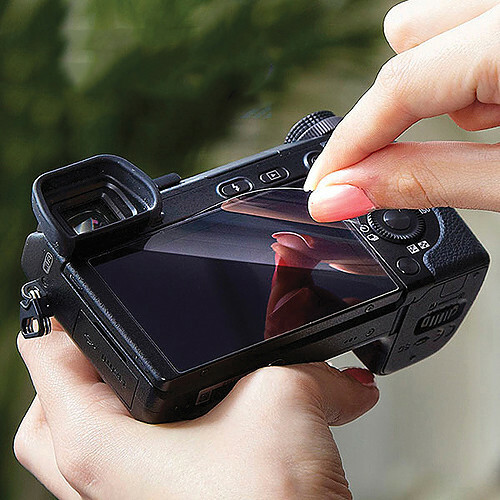 It's made to fit the exact dimensions of the camera's display. A silicone gel layer allows the protector to cling securely without leaving a sticky residue behind. The protector is easy to install without trapping any air bubbles, and is just as easy to remove. The tempered optical glass is extremely thin but also scratch and shatter-resistant for reliable durability. Additionally, its near-perfect clarity preserves the sharpness and brightness of the image you see on your camera's screen. The protector enables touchscreen operation.